ISIC 2015 was first of kind “collab-etition” format consisted of students from three different universities – O.P Jindal Global University (Jindal Global Law School), The University of Southampton and the Lahore University of Management Sciences. The students navigated their cultural, ideological and disciplinary differences to come up with innovative ideas for sustainable social enterprises. After an intense competitive pitch on the last day, team “Sashakta” consisting of Pulkit Mogra (V year) and Rachit Srivastav (V year) from Jindal Global Law School along with 2 UK students and 1 Pakistan student who emerged victorious. The winning team and their venture, ‘Sashakta’ will receive free support from a leading crowd funding platform in the UK and undergo incubation from all three partner Universities for the fruition of their social enterprise. LiveLaw: How do you feel after this achievement? 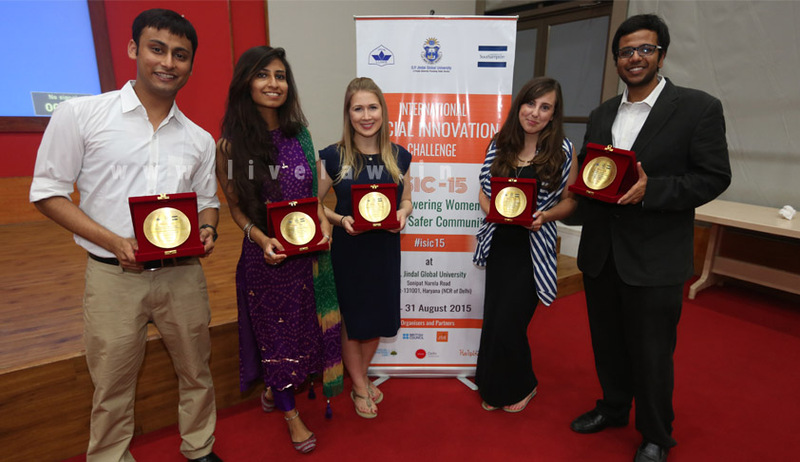 Rachit: We are extremely elated to have won the Social Innovation challenge. It is our belief that being a human demands oneself to assist the society for a holistic growth. We hope that the idea that we have brainstormed aids our beneficiaries to achieve a change in lifestyle for their betterment. LiveLaw: Could you please explain the procedure of the competition? After completing these workshops, we had a final pitch session, where we used all the tools, which we learnt during our workshop sessions, which actually helped us in refining our plan and gain clarity over our model. LiveLaw: How did you get to know about International Social Innovation Challenge? Rachit: Pulkit was working with the Social Innovation Lab at our University under the guidance of our Professor Jeremy Wade. Both of them introduced me to the idea of the International Social Innovation Challenge. We think that the strive for social service was a common string that all of us were connected with and something that got us together. LiveLaw: This was an entrepreneurial challenge did your legal education help you? Pulkit Mogra :Legal education plays its role everywhere, irrespective of whatever work you are doing. Since the theme of our workshop was “Women Empowerment through Safer Communities”, where we were dealing with issues like safety, education, rights, empowerment etc. therefore we referred to various laws and policies like right to education, laws for women safety, The Convention on the Elimination of all Forms of Discrimination Against Women (CEDAW) while making our social enterprise model. LiveLaw: How did you prepare for this competition? Rachit: We prepared for this challenge by understanding and studying the different Social Enterprises that were already running in and around the region we aimed our Social Impact on. Coupled with this we also identified the existing issues that are acting as barriers to social growth in and around our region. LiveLaw: What are the other activities you are involved in your law school other than studies? Also I have served as President for Jindal Students Food Committee for 3 years in past and have been event organizer for 2 years for Abhivyakti Society in Jindal. I have also published research papers on IP, CSR and Water Laws. Organizing different fests, I have also published a paper on IP and research assistant for various research centers. LiveLaw:What was the best thing you learnt from the challenge? Rachit: By far the most crucial aspect that both of us gathered from this competition would be about the mindsets of individuals. Mindsets are complex manipulations that have grown over time and are increasingly impossible to change in the short run. Thus, to tackle this issue we proposed to start the change by targeting our audience at the subconscious level. LiveLaw: Does this challenge change your mindset towards your career? Pulkit Mogra: Yes Of course, before this challenge I had very less idea about what social entrepreneurship. But during the course of challenge, it has really made me to think about a step ahead of entrepreneurship, and thinking about social problems at same time. I think in India, social enterprise is something, which India requires the most in the present scenario because of various social problems still existing at grass root level like basic education, women safety etc. I am really interested in taking my career forward in establishing my own social enterprise in future through which I can make a difference and give back something to community. LiveLaw: Would you please explain your business model? Rachit: Our business model was based on Education of beneficiaries to enable them to be advocates for their own change. We firmly believed that education could be a useful tool to affect change in the mindset of people at subconscious level through incorporation of gender sensitization into the courses rolled out for the beneficiaries. The idea was to run workshops which would be taught by student educators who would in turn be taught by two student representatives who would receive teaching skills from education partners who are skilled to impart the knowledge for the same. There is a needs assessment survey done in the beginning to gauge the interest of the beneficiaries and then subsequently they are taught English and Computer Skills. A basic level of Internet is also introduced to spark interest among beneficiaries and enable them to be more aware of their existing rights. LiveLaw: The team is getting crowd funding to implement the idea so could you please tell us in details about the procedure? Pulkit Mogra: Our model is getting crowd funding via Helping B organization, a crowd funding platform, which offers crowd funding to projects related to social entrepreneurship. Business Model with proper revenue streams. Impact on society and ways to measure that impact. Team available for implementation etc. We have our plan in which we are fitting into all the above required criteria, and once we will submit our detailed plan to Helping B, our plan will be listed on their website and crowd funding will be initiated. LiveLaw: How was the feeling of working with the students of UK and Pakistan? Did you face any trouble at the time of team coordination? Rachit: Working with the students of Pakistan and UK brought a lot of diversity to the ideas that were brainstormed. Since the students in our teams were of different disciplines and of different origins, there were a lot of experiences that were shared from across the countries which helped shape the final idea. There was absolutely no trouble in team co-ordination as there was a lot of respect among the members of the team for habits of each other and the understanding led to a common ground for co-ordination. We loved working with the members of Pakistan and UK. LiveLaw: What was the role of the Professor and College Administration in this challenge? Pulkit Mogra: Professors and College Administration played a major role here, since they were the one who have provided us this platform to perform in this challenge on International Level. Also there was constant mentorship was provided by professors who were part of the challenge regarding our model which helped us to review the model and make it better. LiveLaw: What are your future goals in life? LiveLaw: As the team consist of students from Pakistan and U.K as well then how will you implement your business idea? Pulkit Mogra: Our whole team will be involved in implementation of this idea, although 3 of our participants are from UK and Pakistan, but that actually doesn’t affect us much because we can easily discuss our projects over mails and skype calls. Ones this plan gets implement successfully in our University, and then we will surely think about implementing the same model in Pakistan and UK as well. Also we are getting incubation support from all 3 universities who have their incubation centers in place. LiveLaw: How many teams participated and who were your closest competitors? Rachit:Six teams participated and we felt that although the team which proposed the idea of research and education came second most even the third team which proposed an app were close competitors. We think all the 3 ideas were absolutely brilliant! LiveLaw: What do you think about the laws in India for women safety ? Pulkit Mogra: When we talk about laws for omen safety, we have more 7 women specific legislation and 44 women related legislation, so when it comes upon quantity wise, I think we have enough laws in India to ensure the safety of women but the problem we face is on implementation of these laws, where we need to work upon. Also a major problem, which I think we face is regarding our patriarchal mindsets, which often don’t allows these laws and regulations to play their part. LiveLaw: What changes you want to bring in India for empowering women? Rachit: We think the biggest change has to be from within, that is the mindset of the individual. Thus, although we can have various Social Enterprises that might be successful, the problem still remains rampant due to lack in change of mindset. LiveLaw: According to you how can we make India safer for both working and non working women? Pulkit Mogra: When we talk about making community safer for women, its just not laws and law enforcing agencies which are required to play there role efficiently but it is also the society which is required to play its part in making the community safer. Here in this space, education can play the major role but that will make take some time because I think education cant change mindsets over a night so for the time being I think security agencies, women organizations etc. will also be required to play there part. LiveLaw: Can the change in the law empower Indian women or India need to work beyond law and take more steps to empower women? If yes, what further steps should be taken? Rachit: Yes, changes in the law can definitely empower Indian Women. For instance making Domestic Violence a criminal offence will bring about a drastic positive change. However, at the cost of reiterating, we still believe that there are ways to inculcate changes over and beyond the law by spreading awareness and changing mindsets through education. LiveLaw: What message would you like to give to the other law students? Pulkit Mogra: To every law student I would only like to say one thing, “Keep Exploring” and “Follow your heart”, you won’t regret whatever you may do after that. There are a lot of bigger issues, which are prevailing in society, so just try to give something back to the society to make sure it remains a better place to live in.